Welcome your guests with a pineapple - It is the universal symbol of friendship, generosity, hospitality and other forms of social warmth and graciousness. A great way to start your special event! This pineapple themed compact mirror case is made of hard molded plastic that has a textured leather-like finish. A stunning raised pineapple design decorates the middle. The case is plated in a rich gold metallic color. The two sides of the compact are hinged together and have a clasp on the bottom for easy opening. Once opened, there are two glass mirrors on either side of the gold compact. Don't miss out on the hot pineapple trend! These compacts make great favors to welcome your guests. Mirror case made of hard molded plastic. Case is plated in a rich gold metallic color. Textured leather-like finish. Raised pineapple design in the middle. Two sides of the compact are hinged together. Clasp on the bottom to open. Inside are two glass mirrors on either side of the compact. Packaged in a clear display box with a gold metallic ribbon wrap and bow. Attached to the ribbon is a white 'For You' tag with a gold pineapple design accent. does it come with individual tie and pineapple tag? 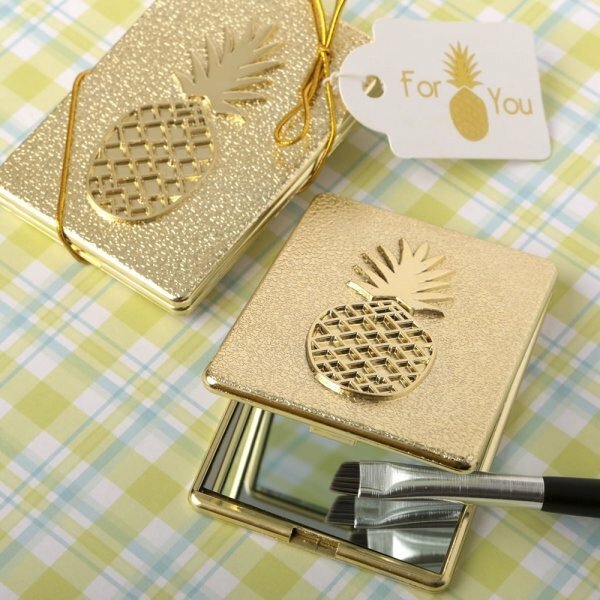 The Pineapple Themed Compact Mirror Favor comes with a gold metallic ribbon wrap and bow. It also have a 'For You' tag with a gold pineapple design accent.